In Park City, we were already up in the mountains a little bit, but we still had the rest of the Rockies ahead of us. I had been pretty worried about the Rockies – some truckers we had spoken to in Sparks, NV had said that it got as steep as 7% grade. I was not very confident in the bus’ ability to make it up something that steep, but the new fuel pump seemed to be working wonders. We were chugging up hills (of a much smaller grade) at 60 mph. We still had a long trail of smoke behind us, but Mark assured me it was just unburned fuel because of the elevation, and nothing sinister. Since our engine is mechanically injected, it doesn’t compensate for the altitude, and runs rich. We asked him about the Rockies, and if there was anything worse coming up. “Oh, you’re through most of it,” he said. “You’ve just got one little hill and then it’s flat until Pennsylvania!” Excellent! At the beginning of the day we had been seriously wondering if we would need to be towed over the mountains. The trucker next to us was adding some fuel additive to his tank, and offered us some. Soon we had a water bottle full of fuel additive and a tank full of diesel, and we set off again. That one little hill turned out to be the biggest we had hit so far. Or at least the longest. At one point we were down in second gear trying to keep speed going up the hill, but we made it, and entered the low rolling hills of Nebraska. We didn’t stop until we hit Omaha, and actually slept on the other side of the state line in Council Bluffs, IA. 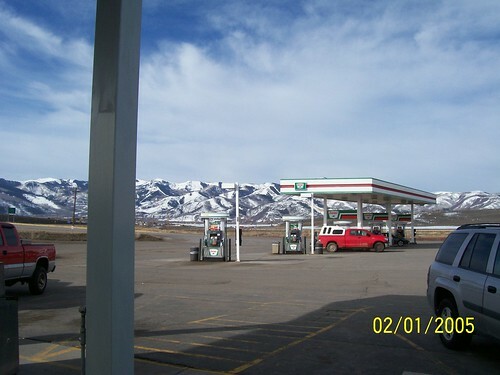 This entry was posted in the Tour and tagged Omaha, Park City, What Roses?. Bookmark the permalink. pittsburgh is waiting for you kid.